Darren Fendrick was located by his family, who called the Arcadia Police Department. Mr. Fendrick is now safe and was taken to a facility for assessment and treatment. Thank you for your tips and cooperation! The Arcadia Police Department seeks your help in locating a missing "at risk" person Darren Allen Fendrick, a 6 foot 3 inch, 400 pound, white male. 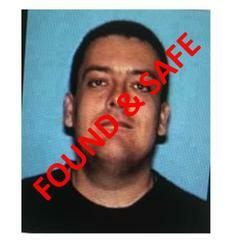 Fendrick was last seen in the area of Foothill Blvd. and Baldwin Ave. on 8/28/18 at approximately 3:00 PM. Darren was last seen heading west, on foot, towards the City of Pasadena, and often frequents this area. Darren suffers from a mental condition, and is out of compliance with medication. If you have information that can assist in helping safely locate Darren, please call 911 or contact the police.